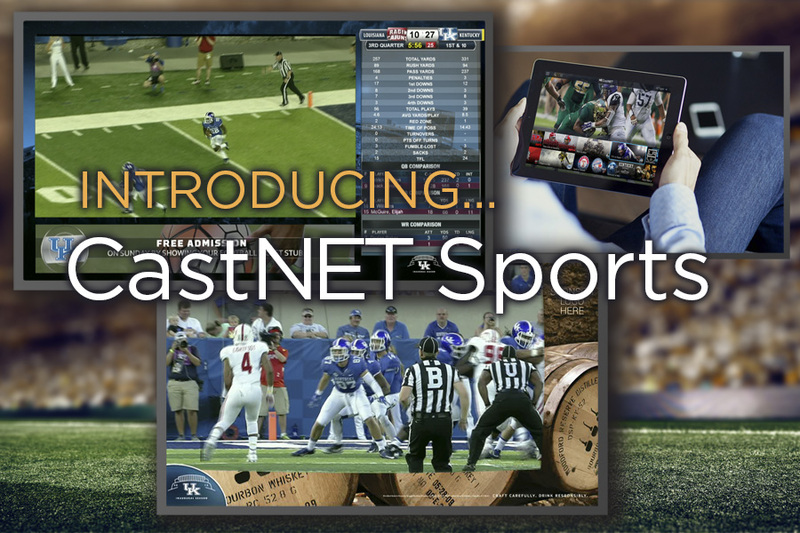 CastNET and the Alpha Video Sports Division are excited to introduce CastNET Sports - a new family of unique and exciting products to enhance the deployment of digital signage systems in professional and collegiate stadiums and arenas. CastNET ConcourseView enables venues to include content on concourse screens from sponsors and advertisers in full screen during pre-game and during the game in an L-bar format that show sponsors and promotions along side the live game action. CastNET SuiteView provides luxury suite guests with a unique iPad and tablet experience to control game-day content including viewing video streams, switching channels, real-time player and game stats, and social media posts. CastNET StatsView shows in-game and pre-game statistics in a full screen format using data plug-ins from all the most popular data source providers. Data sources may be mixed and matched depending on application. CastNET MenuView screens are installed over food and merchandise concession stands and easily integrated with popular POS systems. One of the most important features of CastNET Sports is a simple yet powerful software tool called GameDay Control. GameDay Control allows authorized personnel to login and use a web browser to schedule screen content to switch on any screens in the venue or to switch screen content manually in any screen zone throughout venue. Stadium-wide manually switching is important because an operator, for example, never knows the precise time for the start of the half or end of the game.